For other uses, see ಕೃಷ್ಣಮೃಗ (disambiguation). 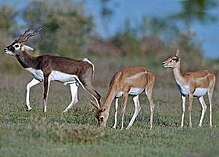 A blackbuck in central India. ↑ Mallon, D.P. (Antelope Specialist Group) (2003). Antilope cervicapra. 2006. IUCN Red List of Threatened Species. IUCN 2006. www.iucnredlist.org. Retrieved on 13 February 2010..
ಈ ಪುಟವನ್ನು ೫ ಜುಲೈ ೨೦೧೬, ೧೪:೩೫ ರಂದು ಕೊನೆಯಾಗಿ ಸಂಪಾದಿಸಲಾಯಿತು.